Our old buddy and fellow U Calgary grad makes the news! Pat Druckenmiller, in the collection room of MSU's Museum of the Rockies, displays the skull and lower jaw of an ancient sea monster found in central Montana. (MSU photo by Jay Thane). Ken Olson of Lewistown and his son, Garrett, found the fossils in mid-August about 75 miles northeast of Lewistown. Since Horner was in Mongolia, Olson said he prepared the fossils himself and delivered them to Horner about three weeks later. Olson, a retired Lutheran pastor, has long collected fossils for the museum. Two of his best finds are the large Torosaurus skulls displayed there. "It's a very important specimen," MSU paleontologist Jack Horner said at the Museum of the Rockies where the fossil rests in boxes. "We have been looking for it for a long, long time." A long-necked elasmosaur. (Illo courtesy of Dr. Druckenmiller). "If the skull is 40 cm long, the neck could be seven to 10 times that length," he said. 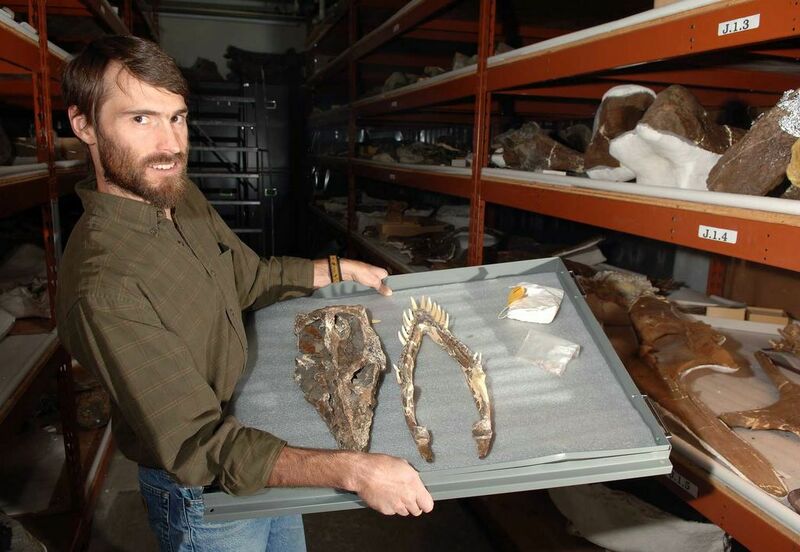 "This is basically the first good elasmosaur (long-necked plesiosaur) skull found in Montana," Druckenmiller said. "That, of course, is really neat. In fact, I would say this is one of the top five skulls of an elasmosaur in North America."